This recipe will give you a tasty way to add some healthy zucchini into your diet. Containing only 6 ingredients, these fritters are quick to throw together for any occasion. 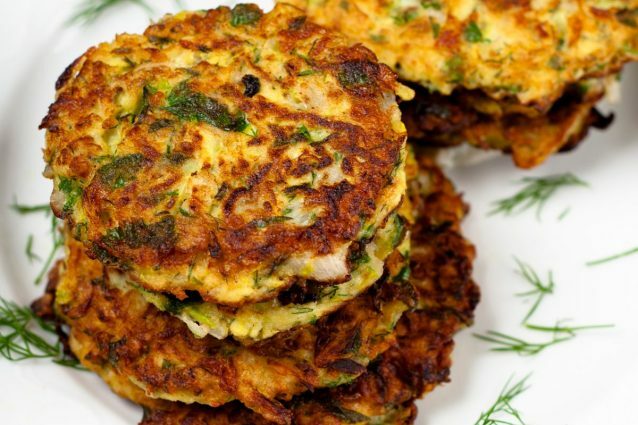 Zucchini is shredded and drained of excess water then mixed with eggs, parmesan and spices to create the fritter batter. A few minutes in a frying pan and the hot, delicious fritters are ready to eat! Great for a snack, an appetizer or a side dish to any meal, these are sure to be a hit with everyone! Grate the zucchini into a large bowl. Squeeze the excess water out of the zucchini getting out as much liquid as possible. You can do this with your hands by simply squeezing the zucchini, you can push the zucchini against a small mesh strainer or you can wring the zucchini in a cheesecloth. While the cheesecloth method will work best, any of these are fine- just try to get out as much water as possible! Add the salt, flour, cheese, egg, pepper and garlic powder to the bowl and mix to form a nice batter. Shape the batter into fritters, any size you would like, and place them on a plate. Heat the olive oil in a skillet over medium heat and place the fritters in the hot oil. Fry the fritters for about 2 minutes. Flip the fritters over and fry for another 1-2 minutes. Remove the fritters from the hot oil and onto a paper towel lined plate. Serve the fritters while hot paired with your favorite dipping sauce or just eat them plain! -The fritter batter and patties can be made earlier in the day and then refrigerated until you are ready to fry and eat them. Try not to make the batter more than one day ahead as the zucchini will begin to brown and not look so appetizing. -Chili mayo, dill and herb yogurt sauce or garlic sour cream all make great sauces to pair with these zucchini fritters. -If you do not have olive oil, feel free to fry the fritters in vegetable oil or even peanut oil.